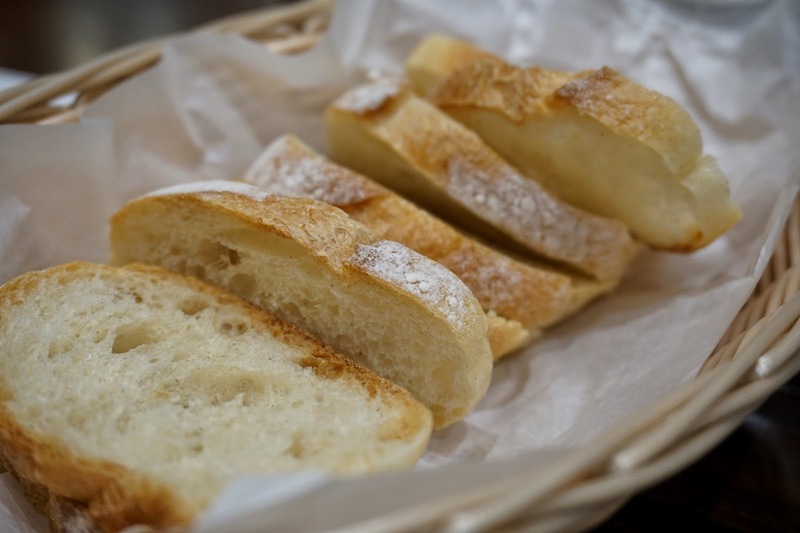 French food is one of the cuisines that remains to be the unpopular choice for the local market. 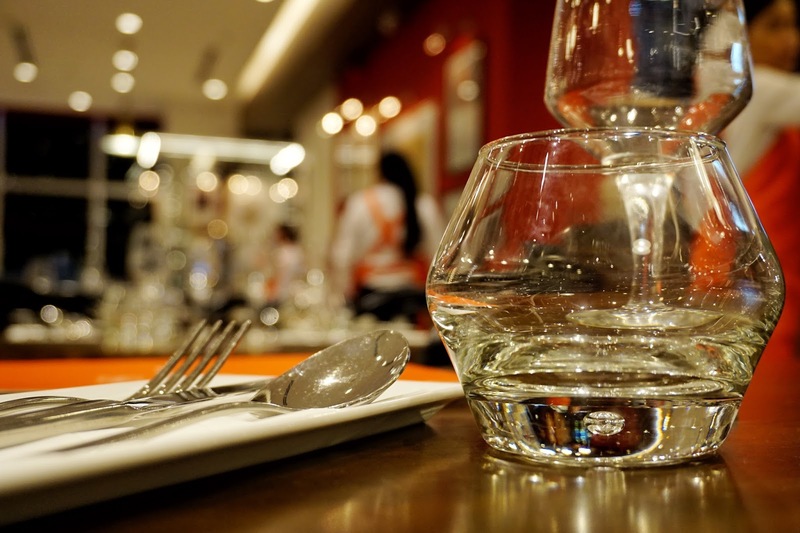 It is perhaps of its fine-dining image or its not so friendly price tag per dish. 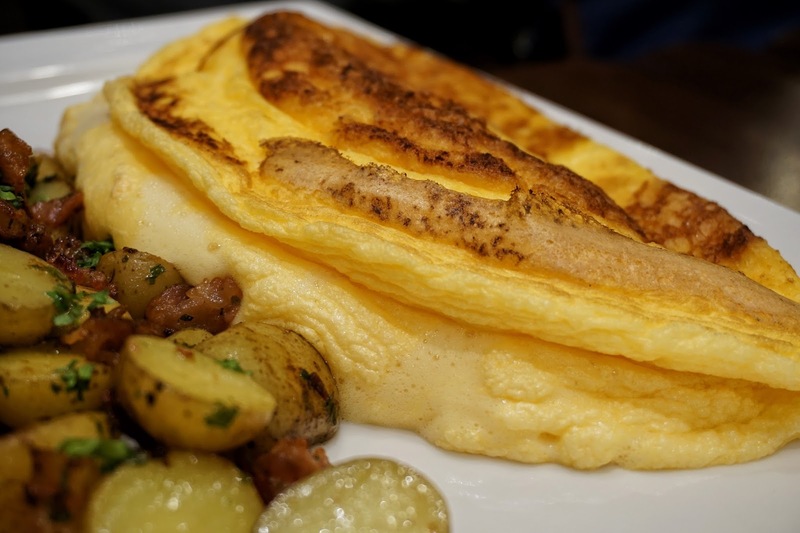 But when we're talking about fluffy puff omelettes, it somehow changes our perception of how French enjoy their food. It becomes more familiar and inviting. 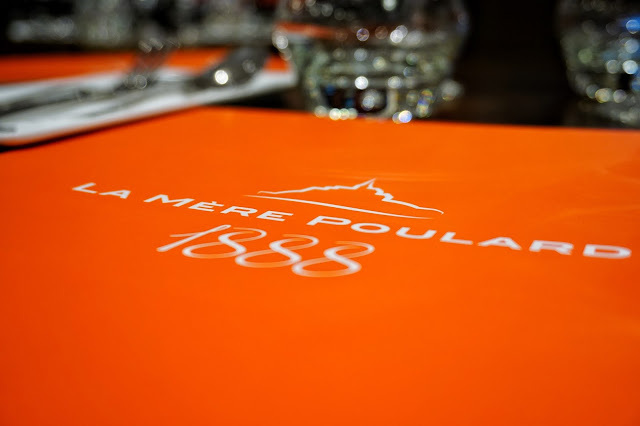 La Mère Poulard or "the mother Poulard" was founded in 1888 by Annette and Victor Poulard who were running Hostellerie de la Tête d'Or in Mont Saint-Michel, Normandy, France. The idea of cooking giant omelettes came in the picture when the couple were finding a reason for their guests to stay. And the rest was history. 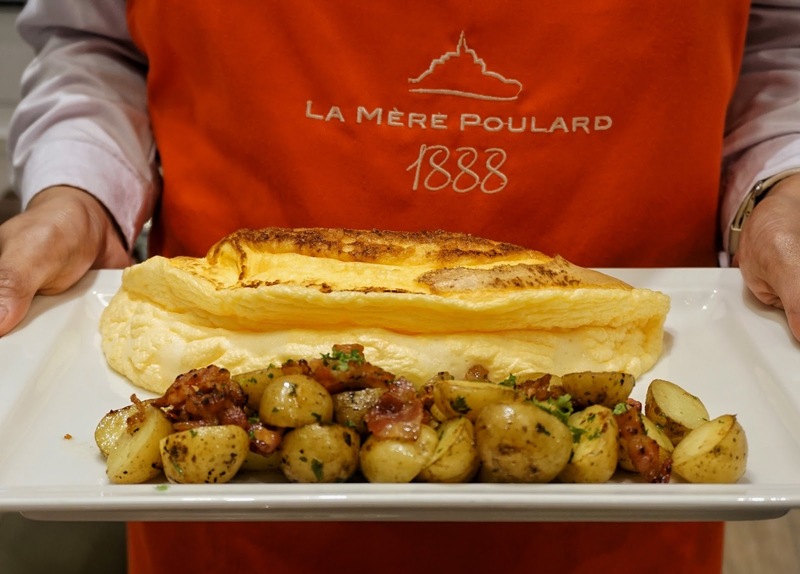 Known for its fluffy puff omelettes and hand-hammered copper bowls and pans, La Mère Poulard became a destination for food enthusiasts all over the world including famous personalities like Ernest Hemingway and Yves Saint Laurent. 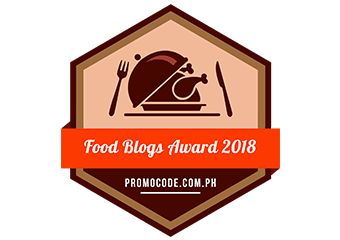 It was an honor to have a restaurant with such history land in Manila and I was looking forward to visit this place to indulge in its world-famous omelette. I arrived around 6:30 p.m. and the place was barely packed. I figured that it was because I visited on a Monday and that most are rushing to beat the traffic than linger inside a mall. 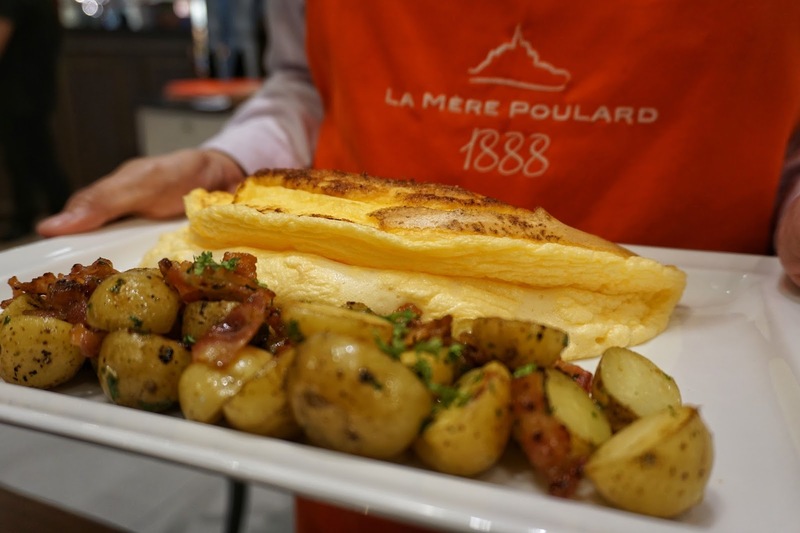 As I wait for my friends, I browsed through La Mère Poulard's menu and was pleased to see that there are several omelettes to choose from. And seeing how much it charges for its omelettes, my expectations shoot up even higher. A handful of friends arrived on time and we decided to order a dish while waiting for the rest to arrive and went with Bacon and Potato Omelette (PHP420). While waiting, we were given a complimentary basket of bread and butter. Service was fast and our giant fluffy puff omelette was served in less than 10 minutes. Before putting the plate down, the server warned us that the fluffiness will flop after a few minutes so we have to take photos fast if we want nice photos. And true enough, it got flatter in less than a minute. I was drooling over the masterpiece in front of us as I savor its aroma. I took a bite of the marble potato and some bacon bits which I found great! My eyes sparkled as I grabbed a slice of the thick yet airy omelette. And it tasted like... your usual omelette. I guess you can't expect so much from a straightforward omelette and should focus more on the technique on how it was made in order to appreciate this dish. I read some reviews where they say that the restaurant's rich history adds charm to the food. However, it was hard to put taste on technique or history. At the end of the day, it would be taste that would make me go back or not. And sadly, I was not impressed and found the omelette not worth my PHP420. Perhaps my opinion would have changed if I also tried its other dishes but I always let the star dish to decide for me. We decided to leave after being underwhelmed by our first and last order. Many continue to rave about La Mère Poulard. Maybe it's just not meant for my taste buds. 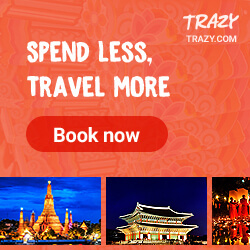 But visiting this place once is enough for me. 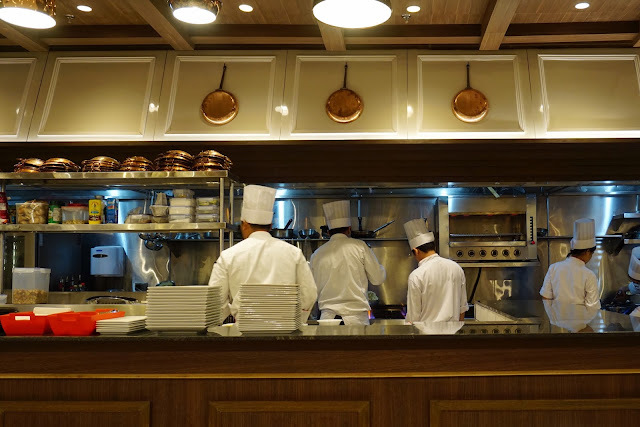 La Mère Poulard is located at Ground Floor, SM Aura Premier, McKinley Parkway, Fort Bonifacio, Taguig City.